Do you know which speaker wire is best? It can be a challenge even if you’re an electrician. By the way I’m not an electrician. After doing some research… This is what I found. 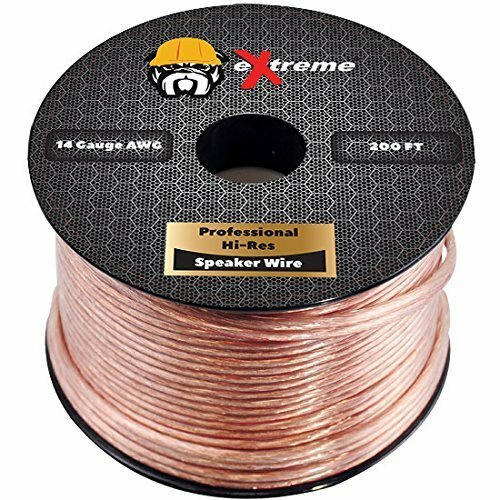 Best Gauge Speaker Wire – 14 Gauge Speaker Wire 250ft Pure Copper. Since I’m not an electrician & I’m not an expert… This short video provides the basics on this topic. Take a look below. Did you know this? From what I have found in my research… Most speakers don’t come with speaker wire. Isn’t this a surprise? It was to me. So what type of speaker wire do you need? This depends on your stereo system. What do I mean? Read more about it in the next section. Are your speakers in-wall or ceiling speakers? Knowing this helps determine which type of wire you need. For in-wall or ceiling speakers… You will need UL Rated Speaker Wire. UL stands for Underwriters Laboratory. These come in two class labels: CL2 & CL3. Why are these important & what’s the difference? The importance of CL2 & CL3 has to do with the fact that they’re fire compliant with the Underwriters Laboratory Standards. In turn, speaker wires with these labels indicates they have met the UL fire testing for the National Electrical Code. The difference between the CL2 & CL3 comes down to the amount of voltage specifications each one can handle. A CL2 can handle 150 volts & the CL3 can handle 300 volts. Both of these are ideal for in-wall & most speaker installations. What about wire gauge? I found that choosing the correct wire gauge maybe of more importance than anything else. Gauge refers to the thickness of the wire. There are numbers assigned by the American Wire Gauge to identify wire thickness. See below. So what do these numbers mean? Basically, the smaller the number… The thicker the speaker wire. The bigger the number… The thinner the speaker wire. How does gauge factor into play? The thicker the wire the better the sound due to the connection resistance. This is the complete opposite when it comes to thinner wire. Each situation requires the use of various gauge thickness of wire depending on the type of speakers, sound system, & installation. What wire gauge is most recommended? It depends on the length of the wire you need to setting up speakers. Generally speaking, a 12 to 14 gauge wire is most recommended for set ups that require longer wire lengths. These also work great for low impedance of 4 to 6 ohms. In addition, this gauge is perfect for higher power connection applications..
Now for shorter length wire requirements of less than 50 feet… A 16 gauge wire will suffice for 8 ohm speakers. The chart on the right shows the gauge, length, & speaker ohms needed depending on the set up. Really helpful for everyone but even more for a novice. I wish I had found this earlier. What makes pure copper wire the right choice when it comes to speaker wires? It’s quite simple. Copper provides a higher level of conductivity compared to any other metals such as aluminum, zinc, & nickel. It’s not even a contest! Pure copper makes for the right choice. Although, pure copper without a doubt provides the best conductivity… It does cost more than other speaker wires. Also, oxygen in copper can affect sound quality… It’s another reason to choose pure copper wire over copper that’s mixed with other metal alloys like zinc or nickel. Pure Copper Wire is 99.9% pure which is considered Oxygen Free. If you want to go cheap on buying zinc, nickel, or aluminum wire… Expect poor sound quality compared to pure copper wire. So choosing pure copper wire is the best route to go when it comes to durability, conductivity, connection, & excellent sound quality. Want to improve sound quality & simplify installment? Here’s a tip that will help. Most of the time speaker wires don’t come with connectors. It’s basically wire that needs to be stripped bare in order to attach to the speakers. To make this process easier you can get connectors such as pin, spade, or banana plugs. These will eliminate bare wire hook ups which can come loose due to vibration. Most experts recommend using connectors for better sound quality, connectivity, & easier installment. I hope this has given you a better perspective about speaker wire for making an informed decision. At the same time helping to improve the sound quality with your stereo system. By the way, you don’t need to spend thousands of dollars on speaker wire to get the best sound. The above choices provide the best option without breaking the bank. Make sure to check out the customer reviews on the above speaker wires & connectors. Post questions or comments below for a follow up response. I never knew they had an impact on performance. Pretty interesting stuff. I guess if you use the proper wiring you get a much better sound. I wonder if that is true. If so I need to look into this for my stereo. Thanks. This is why I wrote this article to help people understand the importance of using the right Speaker Wire. It definitely makes a big difference in the quality of sound. If you want to boost the sound quality & performance of your speakers then make sure to use high quality speaker wire. I highly recommend using Copper Speaker Wire for your stereo or sound system. You will definitely notice a real difference in the output as far as superior sound quality plus it makes for easier installation. Hope this helps & if you have any questions please don’t hesitate to ask. Great article man. I guess I’ll need some UL Rated Speaker Wire since I’m renovating my house and wish to put the wire through my wall, this is the right one isn’t it? Sorry I have no idea about this stuff and you seem to be the expert. Also what sort of price would I be looking at? I’m on a budget but don’t mind going a little higher if I’m paying for quality. Cheers for the help! Thank you for your comment. My recommendation would be to get an approximate measurement of the area to determine length of copper wire you need depending on where you plan to setup your speakers. This should give you an idea about how much speaker wire to get without having to overspend. I would recommend you get extra wire just in case you need it since your in the process of renovating your house. Here some options you can check out: 50 FT. Copper Speaker Wire, 100 FT. Copper Speaker Wire, or . Hope this helps & if you have any other questions regarding copper speaker wire please feel free to ask.